People think that stretch marks only afflict pregnant women, but that couldn’t be further from the truth. Bodybuilders are another significant group that is susceptible to getting them, because of the speed at which the acquire muscle mass. When the gain quickly the skin is stretched beyond its limit and has a tendency to tear. The stretch marks are more common in bodybuilders who use steroids because muscle growth occurs at such a rapid pace (though the stretch marks are not necessarily indicative of the use of steroids). On the one hand, building muscles lets a guy look their best, but on the other hand it causes the appearance of stretch marks which can be quite ugly. Prevention is the best cure when it comes to stretch marks. Try to keep a stable weight and don’t accumulate too much bulk. Do not acquire a large amount of body weight in hopes of converting it net muscle over time. Instead gain lean muscle mass at a slow pace and don’t get fat. Stretch marks are not cause by sweat or a strenuous workout as some falsely believe. Additionally men can certainly get them too, contrary to what some think. If you don’t change the behavior that is causing the stretch marks, then they will only continue or get worse. There are number of commercial stretch mark creams available on the market today to help you deal with them. They are specially formulated to provide your skin with the nutrients it needs to repair its damaged surface. Don’t let these minor nuisances get you down. Stretch marks are a testament to how successfully you are building muscle in a short period of time. The indicate very hard work and you should celebrate that instead of letting it get you down. For more details on stretch marks from bodybuilding and how to treat them, go to the beginners bodybuilding website. The bodybuilding community has a famous saying that in order to get the most from your workouts, it must be “no pain, no gain”. Unfortunately, anybody who abides by that is likely to cause long term and irreversible damage to their bodies through painful injuries. The only benefit pain has for us is telling us that we are doing something wrong and that it must be corrected, including bad form and dangerous exercises. 1. Use free weight exercises as they are the only true safe movements that your body was made for. Exercises done using machines are mostly dangerous in a subversive way and it does not help that most mainstream exercise literature promote them. Machines force your body to move in unnatural motion planes that lead to injuries, while free weights force your body to adapt to pressure using movements that it is familiar with. 2. Other than sticking to free weights, perform exercises that work your major muscle groups. These include squats, bench pressures and deadlifts. Again, they have been given bad press for being dangerous exercises. However, they provide a more balanced workout and all exercises can be considered dangerous if they are executed in poor form in the first place. 3. There is no need to neglect your small muscle groups, but they should not be the priority. Include a small number of related exercises such as bicep and hamstring curls. 4. Working out in the gym is the stimulus your muscles require to grow in response. However, you need adequate amounts of rest and nutrition as a foundation for the muscles to recover and become stronger. After a heavy workout with the major exercise, there should be at least 24 to 48 hours of rest before the next training session, plus the right levels of nutrition. Failing to do so would invariably lead to a tired body and mind, which in turn brings one down the path of injury and overtraining. 5. Never go into a workout set with cold muscles. Perform a few warm up sets to get blood flowing to the muscles and keep them warm. This will also help your mind and body get in focus for the proper sets when the heavier weights are in place. Again, all this is done to avoid injuries that might result from ill preparation and a lack of concentration. You will be able to enjoy safer and more productive bodybuilding workouts by observing the suggestions listed above. In order for muscles to grow well safely, you need to push them to their limits sensibly. Pain is always negative and should be avoided at all costs. Colin Zane relies on safe bodybuilding exercises during his workouts. Colin also recommends the same for every trainee in order to enjoy long term health benefits from weight training. When men are trying to build body, most of them are impatient and want to reach their goals faster. A lot of people are dying for the secrets of how to build muscle faster, here is some thing for you and you will get results within weeks. Don’t do too much is the first thing you should remember while you start build muscles. There is a common mistake that many people think it is right – do more reps and lift more weights and you will get better results. Since there are so many ways for building muscle faster. Don’t overtrain your body. It is seriously wrong way to do it. If your muscles were overtrained or overexerted, you may lose on weeks or even months workout time due to the recovery of muscles. If you are recovering on your back, you can’t continue building muscle. Setting your maximum weight lifting of muscle strength at 70 to 80 percent is a good idea. Because breaking down more muscle means that your muscle has to repair itself and more muscle will be added with each of those repairs. Finishing workout exercise within one hour is what we called fast muscle building. It cause accumulated lactic acid in body and hurts your muscle building process. Aerobics are nothing good in building mass muscle. But they are good for cardio. In fact, aerobics not only have nothing good for muscle building but also interfere it. Intake mass fish and lean red meats. Such as, salmon that contains high amounts of Omega-3. In order to grow more muscle, you need the protein in lean red meats. After finishing you weight lifting workout, taking a day for rest. In other words, you will not have two weight lifting days in a row. You also can train certain part of muscle in day 1 and train totally different part of muscle in day 2. This is fine if you let the muscles worked out the previous day rest. You also need to get enough sleep. Your body requires plenty of sleep in order to heal. As we mention before, our body will add more muscles after the muscle repairs itself. Proper hydration is also needed for building muscles. The function of suitable hydration is regulating your body temperature, cushioning your joints, eliminating body waste and carrying nutrition. These are tips that you should try out for having healthy body and good working out. Lean chicken, lean red meat eggs, tuna, salmon are good protein source for your meal plan if you are trying to build muscle faster. It’s important that you eat lean meats. In order to increase your muscle growth, fat loss and increase muscle strength, you can eat some foods that will stimulate your testosterone level, like red meat and salmon. You should consult doctor for suitable rest of muscles. Your doctor will advice you how to stay in healthy. Sleep 8 to 10 hours daily is important for building muscles faster. The purpose is relaxing. That amount of sleeping will relax your muscle. If you have any chance for sleeping, sleep as much as you can for more muscle mass growth. Burn the Fat and Keep the Muscle, Is it Possible? When most people diet or exercise, they don’t do it because they are worried about the amount of unsightly muscle they have in their body. Unfortunately, this is the way most people approach their weight loss. They do end up losing weight because of this, but the weight loss is from muscles instead of fat. But, there are good ways to maintain your current muscle mass while losing weight, which is good news. The mistake most people make when trying to lose weight is to dramatically cut down their intake of calories. On one hand this makes perfect sense, because every 3,000 calories you take in but don’t burn off is going to add an additional pound to your weight. Unfortunately, this is the worst tactic you could try if you don’t want to lose muscle. When your body stores up fat in the first place, it does so because it wants to have a backup supply of energy in case you go through a famine period. That is a period when you don’t have enough to eat to keep you alive. Your body does not automatically use up its stockpiles because you have stopped your calorie intake. Those are the emergency, last resort rations. Your body will begin to turn your muscle into energy and then your metabolism will slow, meaning you’ll need less calories, so it will be more difficult to lose weight. A good plan to lose weight is by reducing your calorie intake and letting your body adjust to these changes. For example, one might reduce your caloric intake by 10% weekly until your goal is met. You must perform the proper excercises in order to burn fat and not muscle. To focus on cardiovascular workouts, is what most fitness instructors and health advocates are going to tell you. It will help your heart and lungs get stronger so you can do more exercise without getting worn out, so it’s a good way to start. But, it will be great if you need add some weight training to that recipe at least 2 to 3 times a week. That way you’ll be replenishing lost muscle and adding new muscle mass. Your metabolism is going to increase which means you’ll burn off more calories and lose weight if you have a lot of lean muscle mass in your body. You’ll also see another benefit of adding some weight training into the mix, muscle tone. Many people who lose weight too quickly or without properly exercising end up flabby. There is a high cost and it is very risky for certain plastic surgery procedures but they can help with that particular problem. To minimize loose skin while dieting, you should exercise to build muscle tone. Does Whey Protein Have Bad Side Effects? There are some bodybuilders out there who wont take whey protein as a supplement because they think that there are too many bad effects to taking it. Are there any bad side effects to whey protein? Here is what you need to know to decide whether or not whey protein is going to be safe or not. One thing that you might hear a lot of guys at the gym say is that whey protein gave them an upset stomach. This could definitely be true, because whey protein is made from milk byproducts. If youre allergic to milk, you are probably going have the same reaction to whey protein. The reaction that you get is going to be similar to a food allergy, including symptoms such as diarrhea, a stomachache, bloating, gas, and perhaps a bit of swelling. If you experience any of these symptoms, of course you should stop taking whey protein. Usually, these symptoms will only last for a couple of hours and then go away. If you know that you are allergic to milk you should definitely avoid whey protein and choose other sources for getting the protein that you need for bodybuilding. Whey protein is often said to be responsible for wrecking livers and kidneys. It is unknown whether or not this is true. It is known that whey protein isnt more difficult for your kidneys or liver to process than other protein substitutes. The harm comes when you add too much protein to your diet. For bodybuilders who need the extra protein and are careful using it, it is probably not going to be a problem. If you aren’t a bodybuilder and consume too much protein, it is going to be difficult for your body to process it, and it could turn into a problem. Consuming too much protein will eventually lead to your body having troubles digesting it properly. Whether or not whey protein is going to ruin your liver is probably going to be something you want to think about before starting the use of this product. Remember, whey protein is no more dangerous then any protein product so keep this in mind and you should find the decision easier. 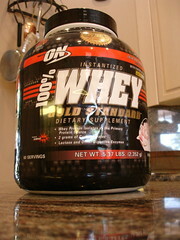 In fact, whey protein is a very healthy substance to be taking in and it has many benefits to it. Usually these benefits far outweigh the risks. One danger of whey is that it may lead to osteoporosis later in life. Before purchasing your first can of whey protein, you are going to want to look at this side effect. Studies have shown that your risk of osteoporosis increases only if you use whey protein for a long time. If your plan is to just use whey protein supplements to gain lean muscle mass and then stop using it, you are probably going to be ok. You may want to talk to your doctor to discuss whether or not whey is going to have serious side effects on your health before starting to take it. There is some truth to the statement that there are some negative side effects to taking whey protein as a bodybuilding supplement. However, adding whey protein to your diet is probably going to give you more benefits and make the side effects seem really small. If you decide to take another protein supplement to increase your muscle mass you are probably going to find that the side effects of it are the same or worse. There are not that many people out there that know that whey protein is relatively safe and an excellent protein supplement. Fitness Supplements Vitamins is one of Europe’s leading protein companies and stocks syntha 6 You are welcome to reprint this article – but get your own unique content version here.